One of the major parts of C++11 is the new smart pointers. But why do we need them, and why should you steer away from the old style pointers? This post is intended both as an introduction, and a reference guide to the smart pointers found in C++11. It will cover what they are, how to use them and how they work. C++ supports dynamic memory allocation ( new / delete ). It’s a way of creating a object whenever you need it. The object will live until you call delete on it. Otherwise it won’t be deleted, not even when it goes out of scope. And if you don’t delete it, none will, which in turns causes memory leaks. It might also cause undefined behavior ( which means anything can happen ) if, for instance, you delete something and try to use it afterwards. Smart pointers will help you with these issues and make your code cleaner and better. Several shared_ptrs can point to the object at a time. All of the above operations are supported for the smart pointers in C++11. This is not true for weak_ptr, but we’ll get to that later. We’ll now take an in-depth look at the smart pointers, one at the time. An unique_ptr is the sole owner of an object that it points to. Two unique_ptrs can also swap objects, but they can never manage the same object. And as with all smart pointers, it takes care of deleting the object. This is pretty straight forwards ; template parameter is the type and you supply an allocated ( new‘ed ) object. The second alternative is using a function named make_unique, this is in most cases better, because it constructs the object and it helps prevent errors. It also follows the naming convention ofshared_ptr which can be constructed in the same way with the make_shared method. Newer versions VisualStudio should support this without you having to do anything. The unique_ptr is being destroyed. Happens when the unique_ptr goes out of scope. Releasing the object means that the unique_ptr stops managing the object. This means you can let a regular pointer “take over” the object the unique_ptr was managing. So when the unique_ptr goes out of scope or is destroyed in any way, the pointer object it was managing wont be affected. Both of these properly deallocates the original object managed by foo1, calling its destructor in the process. Then the new object returned by new is assigned to foo1 and foo1 now manages it just like it did with the previous object. You can’t set two unique_ptrs to manage the same object, but you can transfer ownership from one unique_ptr to another. And you can swap the managed object of two unique_ptrs. Swapping ownership can be done in two ways ; a member function, or the std::swap() function. std::swap() is a very simple, but also very useful algorithm defined in the algorithm header ( until C++11 and utility since C++11 ). It basically swaps two objects of whatever type you pass as arguments. It can be two ints, two std::strings or two objects of a class/struct or anything else you want. You can use the reset() to reset the unique_ptr This means that we change what pointer the unique_ptr manages, deleting the old one. This method can only be used with raw pointers, not smart pointers. In this case the result is. The other operators works just like regular pointers, so I won’t discuss them here. shared_ptr is, as the name implies, a smart pointer that allows sharing. This means you can have several shared_ptrs that point to the same object. This is not permitted by unique_ptr as we saw in the previous section. When it comes to unique_ptr, the difference between using make_unique and the regular constructor is slight ( that doesn’t mean you shouldn’t use make_unique as often as you can! ) But in a shared_ptr things are different. As you can see, the control block and the Foo needs to be allocated in two steps. First the object, then the control bloc. So make_shared creates the object and the control block together in one operation. This makes the operation faster than creating them in two step, but it requires them to be one object, so here Foo is part of the control block itself. When not to use make_shared? The destructor for shared_ptr is also a bit different from unique_ptr because an unique_ptr will always be the sole manager of an object ( not other unique_ptr or shared_ptrswill be managing it. ) This means it’s always safe to delete, so that’s what the unique_ptr will do. But when it comes to shared_ptrs, we can’t do that before we make sure that no other shared_ptrs are managing it. So what we do is that we look on the control block and how many shared_ptrs are managing it. If this is 0, we are the last owner and we can safetely delete it. The weak_ptr reference count it not checked at this point. I’ll get into why in the next section that discusses weak_ptr and how the relate to shared_ptrs. Similar to unique_ptrs but here we need to do some extra work. There’s two different cases for this ; setting the shared_ptr to be the same as another shared_ptr and setting the shared_ptr to manage a new pointer. Assigning a shared_ptr to a different shared_ptr is done using the =operator. The shared_ptr reference count for sharedPtr is decremented as if we were calling the destructor. sharedPtr now manages the object rawPtr points to. As you can see from the examples, you use opeator= for reassigning to another shared_ptr but reset() for reassigning to a different raw pointer. You can’t use them the other way around. This can help prevent bugs by giving an error if the programmer uses the wrong versions. This works because make_shared creates and returns a fully constructed shared_ptr ( just like make_unique described above ) and the =operator assigns it just like in the example above. 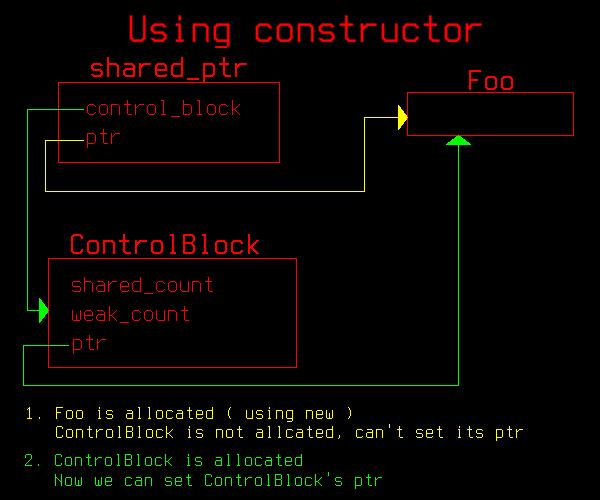 This will, as you would expect, swap both the control block and pointer for both the shared_ptr. It needs to swap the control block since this is what keeps tracks of the number of references to the pointer so these needs to be consistent. This is exactly the same as for unique_ptr. The other operators, just like with unique_ptr, works just like regular pointers, so I won’t discuss them here. As mentioned in the introduction, weak_ptr doesn’t actually manage a pointer. It just holds a non-owning ( "weak" ) reference to an object that is managed by a shared_ptr. It also keeps a pointer to the control block ( the exact same as the one in the shared_ptr who manages the object. This means it has to be created from a shared_ptr so that it can get a pointer to the control block. 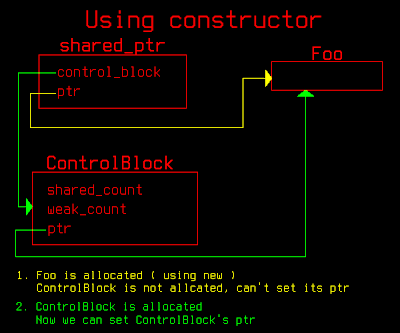 The control block, as we saw in the previous section, keeps a count of both shared_ptr and weak_ptr who’s using the object. We also saw that the object will get deleted if the count of shared_ptrs using the object is 0 regardless of how what the weak_ptrs count is. This is part of the point of weak_ptr; it is not supposed to keep objects alive except for in situations we explicitly tell it to. But even though the managed object will get deleted if the count of shared_ptrs is 0, the control block will remain intact. The control block will only be deleted if both the conut of shared_ptr and weak_ptr uses. This is because the weak_ptr uses the control block to check if the object is alive. All of these will set up the pointer and the control block and increment weak count by 1. Creating a weak_ptr from a raw pointer won’t work simply because it isn’t designed to be managing a pointer by itself. And you can’t use them with unique_ptrs because unique_ptrs are supposed to be the sole owner. The object a weak_ptr can be reset ( so that it no longer references any object ) using the destructor or the reset() function. weak_ptr has the function lock(). What this function does is that it makes a shared_ptr of itself. 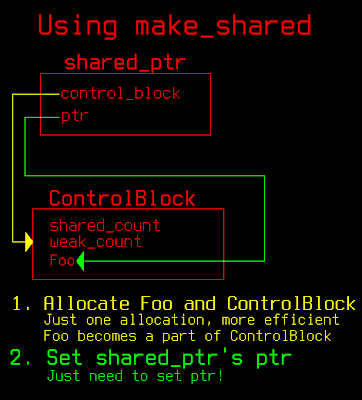 This shared_ptr will work exactly as any other shared_ptrs maintaining the object. It will increase the shared_ptr count, so this shared_ptr will keep the object alive. If the object has been deleted, it will still return a shared_ptr. But this shared_ptr doesn’t point to anything, it’s essentially a nullptr. It will return false if you use it in a if or loop condition, just like a regular shared_ptr or unique_ptr that doesn’t manage an object. This function is the crucial part of the weak_ptr. It enables us to keep weak_ptrs that refers to object maintained by a shared_ptr without preventing it from being deleted and we can still use it safely when we want. // We leave our scope. The content of sharedPtr has been deleted, but weakPtr still refers to it. Here everything works as intended. The weak_ptr refers to sharedPtr which has a valid object inside this scope. The shared_ptr returns false and it doesn’t enter the if. A weak_ptr can’t release the object because it doesn’t have control over it, and the object might be NULL. For this reason, weak_ptr does not have a release() function. The closest thing is the reset() function described above. This will, as you would expect, swap both the control block and pointer for both the weak_ptrs. It needs to swap the control block since this is what keeps tracks of the number of references to the pointer so these needs to be consistent. Since we are not managing the object, we don’t need to worry about deleting it. For the process of the user to make it on the smart pointer then you should know that process from the help of the google drive support to make that kind of things perfect for you.